This page should be updated due to game changes. Reason: Missing: Skilltraining time and all the player made info (fits, summary, tactics etc.). 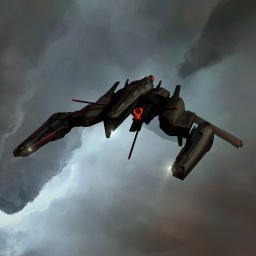 A light, long-range combat ship that may be considered the Collective's approach to standoff destroyer designs, the Kikimora is another Triglavian design that has proven adaptable to capsuleer technology, as with previously recovered examples of ship architecture recovered from Abyssal Deadspace. As with other light combat vessels in the Triglavian lineup, the Kikimora is capable of mounting Light Entropic Disintegrators and an array of support weapons such as energy neutralizers and pulse weapons. The ship also makes limited use of drones and has a long-range remote repair capability. Released with the Onslaught expansion in November 2018, the Kikimora has seen popularity as a kiting PvP ship, with the ability to do high damage at long range compared to other destroyers. Further information about additional or recommended skills to pilot Kikimora for specific or common role(s) can be written here. No sub-article about Kikimora roles or piloting tactics. You can write them here. This page was last modified on 20 January 2019, at 03:24.